As Greece are due to be bailed out with an EUR 85m injection more pension reforms are due. There will be a continuance of cuts on the path to stability. As part of the deal to avoid exit from the European Union, the latest reform has been actioned changing the system that saw Hairdressers and TV presenters as dangerous professions. These professions are no longer part of the system which enables employees to retire early; the qualifying professions have been cut to around 100 from 580. Greece have pledged to change the retirement age to 67 or 40 years of service, Alexis Tspiras estimates that this change would, by 2020, bring permanent savings of 0.25, early retirement penalties would be increased, and health cost contributions raised to 6 percent from 4 percent. The agreement to bailout Greece also included specific reference to a zero-deficit clause, this is due to be implemented by October. This policy would essentially forbid the government for spending more in pension benefits than it takes in every year. 2012 –The Greek government has phased in pension cuts from 2010 to 2012 as part of the austerity measures agreed upon with international lenders in 2010. The cuts of November 2012 lowered supplementary pensions by five to ten percent and main pensions by up to 44% "About 45 per cent of Greek pensioners receive less than €665 monthly, below the official poverty threshold" yet creditors demand further cuts. 2015 - The top administrative court in Greece has ruled that the cuts were against the country's constitution and are to be reverted. the Council of State ruled that the cuts were "depriving pensioners of the right to a decent life." Prime Minister Alexis Tsipras has promised to roll back austerity and reverse some of the cuts made during 2010/12. The current Government is set to end the austerity measures and bring pension payments back to the same levels as pre 2012 which includes the reintroduction of the 13th monthly pension payment (the Christmas bonus). However, this is set to cost the state 1.2/1.5 billion euros and has prompted a standoff with EU-IMF creditors. Other reforms -The SYRIZA party (The economic team of the radical left) are to negotiate further reforms. Legislation is set to be passed which puts an end to special pension arrangements allowing certain persons to retire early, such as those deemed to work in dangerous environments which included "firemen and construction workers, certainly, but also hairdressers (because of the chemicals), wind instrument players (gastric reflux) and radio presenters (microbes in microphones)". "Creditors propose retirement at 67. For those who retire after June 30, 2015, they propose a contributory pension after completing the age of 67. They also want the abolition of the social solidarity allowance for pensioners (EKAS) that applies to low pensions. Finally, they want across the board cuts of pensions by 1% of GDP per year (1,8 billion euros). Greece proposes no pension cuts and that pensioners' rights should not be affected. They also want postponement of the zero deficit clause in pensions while they propose to give no incentives for early retirement." The pension system in Greece has predominantly been based on a generous public pension pillar, although the country's severe crisis has made this look increasingly unsustainable and led to severe cuts. Voluntary occupational and private pension plans exist, but are still of minor importance. High replacement ratios and generous rules for early retirement, especially for women, put heavy pressure on the pension system and contributed to the mess in public finances that saw Greece require a series of international bailouts from 2009. The government has since raised the number of years of work needed to claim a pension from 35 to 37 years and introduced penalties for early retirement. The first pillar covers employees in the private sector and certain self-employed persons. The pension is financed on a pay-as-you-go basis and the contribution rate is unequally shared between the employee and the employer; the actual rate depends on the profession of the employee. Before 2010, it amounted to 6.67% for employees but increased to 8.87% in arduous occupations. The corresponding employer rate was 13.33% or 17.73% for arduous occupations – although the Government is currently phasing in a programme for firms to cut these contributions by one-quarter. For the supplementary pension an additional contributions rate has to be paid. More than 130 funds provided primary and supplementary pension coverage until 2008, when these were merged into just six schemes. Pension benefit rules and levels were standardised among these new bigger funds. The different schemes exist along different occupational lines. Among the approximately 130 funds available, the most important fund for the private sector is the IKA (Social Insurance Institute), which covers 5,530,000 workers and employees. Employees in the public sector are paid directly from the national budget during retirement. A number of cuts have seen public sector pension benefits decrease substantially over the past few years. Besides the earnings-related part of the pension system a minimum pension is paid to those without adequate means. Occupational pension plans can take the form of a pension fund or a group insurance scheme. A pension fund must be set up as a separate legal entity and can be either a single-employer or a profession-wide pension fund. The appointment of an external asset manager is not legally required. Actuarial valuations have to be performed at least once a year. A minimum funding level is imposed with the establishment of a specific solvency margin. This has to be calculated separately for pension benefits and risk benefits. If the solvency margin cannot be met, the occupational pension fund has to submit a three-year plan to the National Actuarial Authority indicating the measures to be taken for funding the deficit. Occupational pension funds that guarantee either a certain benefit or a certain return on investments are obliged to establish adequate re-insurance for these risks. The trend for pension funds is to offer different investment options according to varying risk preferences. The group insurance scheme market is underdeveloped, which is in line with the overall development of the second pillar. Contributions to insurance schemes have been tax-deductible up to the following limits: employer contributions of up to €1,000 a year per employee are tax deductible. In addition, the employee is entitled to make tax-deductible contributions of up to €1,000 an annuity, which can be used for contributions to a group insurance scheme, for individual contributions to a private insurance arrangement, or for a combination of both. 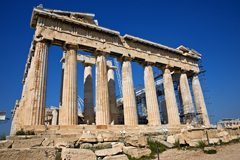 The current economic climate in Greece, however, has led to more and more tax breaks disappearing as part of the country's austerity measures. Companies frequently offer their employees the possibility to participate voluntarily in an additional third pillar pension system based on group insurance policies. The majority of these plans are based on the defined contribution approach. Employers can also contribute to these plans, but this is optional.